This section of the Gesta Stephani deals with events in Bristol in 1138. Geoffrey Talbot had just lost his bases of Hereford and Weobley to Stephan, while Gilbert de Lacy was an enemy of Miles of Gloucester, who at that time was a supporter of King Stephan. The Bishop of Bath was Robert de Lewes, who may have been the author of the Gesta Stephani. Cary and Harptree belonged to Robert of Bampton, who had rebelled earlier. Bristol is almost the richest city of all in the country, receiving merchandise by sailing-ships from lands near and far. It lies in the most fertile part of England and is by its very situation the most strongly fortified of all its cities. For just like what we read about Brindisi, it is a part of Gloucestershire that makes the city, narrowing like a tongue and extending a long way, with two rivers washing its sides and uniting in one broad stream lower down where the land ends. There is also a strong and vigorous tide flooding in from the sea night and day; on both sides of the city it drives back the current of the rivers to produce a wide and deep expanse of water, and while making a harbour quite suitable and perfectly safe for a thousand ships, it hems in the entire circuit of the city so closely that the whole of it seems either swimming in the water or standing on the banks. However, on one side of it, where it is considered more exposed to a siege and more accessible, a castle rising on a vast mound, strengthened by wall and battlements, towers and divers engines, prevents an enemy’s approach. Into this they summoned a stream of horsemen and their dependants on foot, or to be more accurate a torrent of robbers and brigands, on so huge and extraordinary a scale that to those who beheld it it seemed not only great and formidable but appalling and beyond belief. For they appeared from different countries and districts and went there in all the greater numbers and all the greater joy inasmuch as they were allowed, under a rich lord and from a very strongly fortified castle, to commit against the most fertile part of England whatever seemed most pleasing to their eyes. Among the others came the famous Geoffrey Talbot. As was stated earlier, he had been banished from England, and he was preparing to breathe out everywhere the poison of his furious hatred and to do every cruel deed that a frenzied and unbalanced mind is wont to imagine. But by God’s judgement his malice was turned against himself, because while he was planning, to slaughter some and injure others he himself was first captured and very closely confined in chains and barely escaped a sentence of condemnation. Six miles from Bristol there is a city where little springs through hidden conduits send up waters heated without human skill or ingenuity from deep in the bowels of the earth to a basin vaulted over with noble arches, creating in the middle of the town baths of agreeable warmth, wholesome and pleasant to look upon. The town is called Bath from a word peculiar to the English language signifying washplace, for the reason that the sick are wont to gather there from all England to wash away their infirmities in the health-giving waters, and the whole to see the wondrous jets of hot water and bathe in them. This town then, because it was easy to fortify, the people of Bristol tried to add to their resources. They arrived there in column unexpectedly at early dawn. Having brought scaling-ladders with them and other devices for climbing a wall they withdrew into a valley and waited a little while until scouts had examined the site of the town acid the best way of taking it and they could all rush it together with an impetuous onslaught. So Geoffrey Talbot and his relative, Gilbert de Lacy, a man of judgement and shrewd and painstaking in every operation of war, were chosen as scouts. They made their way round the town slowly and cautiously, as they thought, when, behold, the Bishop of Bath’s soldiers, having caught sight of them, suddenly appeared. Gilbert got away from the midst of then, being more crafty and sharper than others, but Geoffrey they surrounded and took, and after fettering his feet very tightly they thrust him into a dungeon under guard. Gilbert, having so unluckily lost his kinsman, went back to his comrades and told of his misfortune with sighs of grief. Yet they did not despair for that, rather were they filled with greater resolution, and mutually encouraging each other and being of one mind to free him they made for Bath, and sending for the bishop under pledge and oath they promised him a free and unmolested exit and a safe return. At last the bishop like a simple-minded man who believes every word, like, another Jacob who lived guilelessly at home, was received by the scoundrels with joy and treacherous intent. At once they laid sacrilegious hands on the preacher of the Gospel, the ministrant at God’s holy table, and the venerable sower of all men’s faith and religion, the steward of the grain in the Lord’s granary, who carries in his breast the ark of God and the divine manna, they addressed with shameless insult and threatened to hang unless he handed Geoffrey back to them. Then the bishop, in sore affliction, since his enemies were softened neither by pity nor by the compassion of a kindly mind on account of his trouble and his own men now within the walls (for when the bishop was seized they had withdrawn into the town, shut the gates, and gathered to defend the walls) could not give him any assistance, humoured their rash presumption, and ordered the man to be released from his fetters and handed over. In this his policy was certainly advantageous and well advised, because if, after taking Geoffrey, he had kept him to deliver him into the hands of the king, he would indeed have made him liable to punishment or danger to his life, but only at the hazard of insult or death for himself. Nor indeed was it prudent or befitting a bishop, to return evil for evil or be harmful himself to harm the harmful. Nor yet did reason demand that by insult to another he should expose himself to insult, it being acknowledged that no one is nearer to a man than himself, and that there is no obligation on him in any wise to give his own life in exchange for another’s. When the man was finally handed back or, to speak more properly, reserved by God’s secret ordinance for later punishment of his soul, that the more plentiful and long-continued his cruel deeds, the more cruel might afterwards be his own torment, then at last the bishop began to make use of his pastoral authority, to demand the fulfilment of their pledge, to ask where was the solemn oath they had sworn, to accuse them of breaking both and to tell them that men could not fare well in other matters who seemed to have lost reverence and a sense of honour and to have offended God on his account. When the bishop went on like this they said they had neither sworn him an oath nor given him a pledge, it being a settled thing in the eyes of every truly wise man that the perjured should not swear and that the faithless cannot give anyone a pledge of faith. This they said to censure the ignorance of the bishop, who put more trust than he should have in men utterly abandoned to perjury and perfidy. So the people of Bristol, unrestrained in the commission of every crime, wherever they heard of lands or property belonging to the king or his supporters rushed thither greedily and quickly like starving and ravening dogs on a corpse that lies in their way; yokes of oxen, flocks of sheep, any object of desire that the eye beheld or the covetous heart yearned for they seized and carried off, sold and consumed. When what was in the neighbourhood, lying under their hands, as it were, seemed to have disappeared down the bottomless pit, they arrived very speedily in every part of England where they heard of men with wealth or property; sometimes they dragged them off by force, sometimes lured them away by cunning; bandaging their eyes, also gagging them either by thrusting a lump of something forcibly into their mouths or by means of a device like a curb-bit with teeth in it that muzzled them, so they took them along blindfold and brought them at length into the middle of Bristol, like Elisha’s brigands that we read about; there they wasted them with hunger or delivered them over to torments and extracted from them all they possessed to the uttermost farthing. Others thought of a craftier trick. Where England was most undisturbed, where peace most abounded and the people was most inclined to tranquillity and a life free from care, they travelled hither and thither in daylight by well-worn and much-frequented ways; they made false statements about their names, positions, and occupations; there was no display of weapons or anything to attract attention in their bearing; they did not use blasphemous and outrageous language as robbers do; their disguise was a downcast look, a modest demeanour, and gentle words full of the milk of human kindness. By this invention of a novel kind of dissembling they made themselves hypocrites until they entirely achieved their expectation and brought to Bristol, the stepmother of all England, some rich man who had met them by chance or whom they had carried off stealthily from wherever it might be. This method of cunning deception, this device of hypocritical pretence became so usual in almost every part of England that there was hardly a town or a village where they did not attempt this perfidy, where they did not leave traces of this abominable brigandage. So it was that none trod the king’s highway untroubled as before, nor did man trust himself to man with the old confidence, but wherever one caught sight of another on the road his whole body straightway trembled and anxiously he shrank from view, either in a neighbouring wood or in some by-road until at last his courage came again and he pursued the journey before him in greater safety and with a stouter heart. So when rumour dinned into the king’s ears that the people of Bristol had thrown the country into confusion by open robbery and, as has been said, by stealthy thefts, though hardpressed on all sides by the prosecution of other business of the kingdom, he collected troops from the whole of England and arrived at Bath unexpectedly as if intending to besiege Bristol. The bishop, who had been warned beforehand of his arrival, came to meet him as he approached the town. 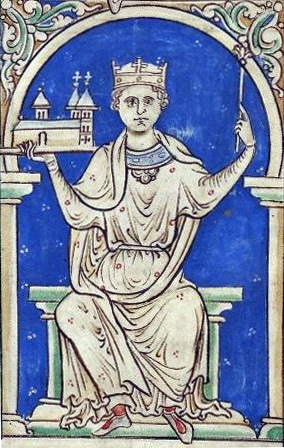 And though at the beginning of their conversation the king showed annoyance with the bishop for having let Geoffrey, a plotter against himself and a destroyer of peace and his country, leave his custody thus unhindered and unharmed, the bishop satisfied the king, with the support of witnesses, that he had been insultingly outraged, nearly hanged and despitefully used by the violence of scoundrels and having at length appeased him and restored their wonted friendship brought him into Bath. The king after inspecting the circuit of the town and going all round it found it to be an impregnable position and admirably suited to resistance, and therefore he gave orders for the walls to be raised higher, the battlements made steeper, and a close and careful watch kept, with the assistance of a numerous garrison, to restrain the people of Bristol. Then, going away towards the impostor Bristol, he led his army near the town, and when he called a council of war and asked his barons how he could most effectively besiege it, by what engines he could put most weight into an assault, by what means he could most readily bring it to submission he received differing and doubtful advice according as some obeyed him loyally, others deceitfully. Some recommended the throwing in of a huge mass of rocks, beams, and turves at the point where the approach to the town narrowed and the two sides nearly met, that with the mouth of the harbour blocked the enemy might no longer get supplies from rowing boats, in which they chiefly put their trust, and also the rivers that wash round the sides of the town, as has been said, might be forced back with rising waters when their current was checked, gather into a lake broad and deep as a sea, and immediately flood the town. They also approved of the king’s building castles on each side of the town to prevent the constant traffic both ways over bridges, and of his keeping his army in front of the earl’s castle for some little time and afflicting the inmates with hunger and many kinds of suffering. But others, and those especially who only pretended to serve the king and rather favoured the earl, made these men’s sound and acceptable counsel of no avail, urging in opposition that it was a waste of time and labour without profit to try to block up the unfathomable sea with masses of timber or stone, since it was very clear that anything rolled in would either sink and be swallowed up from the mere depth of the water or else be entirely washed away and brought to nothing by strong flooding tides. So under their persuasion the king abandoned the siege of Bristol, and after laying waste and eating up, plundering and carrying off everything around it, advanced against two castles, Cary and Harptree, the one in the hands of Ralph, surnamed Luvel, the other in those of William fitz John. They were bound to the earl by ties of friendship, firmly united with him by pledge and oath, and so much his allies by compact and homage that as soon a they learnt he wished to rebel against the king’s power, they joined in his rebellion promptly and by agreement. Finally, hearing that the king had advanced against Bristol and thinking he would long continue the siege there, with one mind they fulfilled their promise to the earl and by grievously ravaging all the districts round them they committed everywhere all the hostile acts they could. But the king came very quickly and besieged Castle Cary with vigour and determination, and since his engine scattered fire and showers of stones among the besieged and the pressure went on until their rations ran short, he at last compelled them to surrender to him under an agreement for peace and harmony. Indeed they could not keep up their resistance any longer owing to weakness from lack of food, especially as the earl, their hope and refuge, had not arrived in England and the people of Bristol could not go to their aid on account of the greatly superior strength of the king’s forces. So he left Cary after a compact had been made and turned his army against Harptree, where he would have seen to the building of a castle in front of it, with an adequate garrison, had it not been suggested to him by the advice of wise men that this castle too he could most conveniently keep in check by the soldiers he had left at Bath, especially because there was a short and easy journey between the two strongholds and it seemed expensive and too burdensome that many should prepare for and engage in battle and siege in many places. At another time, when the king had passed that same castle with an innumerable force of armed men as though he were advancing with his army to besiege the people of Bristol, the garrison hastily came out, intending to attack his army, if a chance were offered, and were following him stealthily on a flank when he at once turned back and gave the horses free rein to the castle; finding it nearly empty he ordered some to set fire to the gates, others to put engines and scaling ladders against the walls, all to make eager and strenuous efforts to break in, until at last he took it, resistance being offered only by a few, and handed it over to the guardianship and care of his own men. Having finally been victorious over Castle Cary, as has already been said, the king hastened, always armed, always accompanied by a host, to deal with various anxieties and tasks of many kinds which continually dragged him hither and thither all over England. It was like what we read of the fabled hydra of Hercules; when one head was cut off two or more grew in its place. That is precisely what we must feel about King Stephen’s labours, because when one was finished others, more burdensome, kept on taking its place without end and like, another Hercules he always girded himself bravely and unconquerably to endure each. This item is under copyright of Oxford University Press (OUP), 1978, and is used here only by permission of Oxford University Press.